Villarreal hosted Napoli on the 18th of February in the first leg of their Round of 32 Europa League knockout tie. Both teams were in the middle of stellar campaigns with Napoli leading the Scudetto race in their domestic campaign and Villarreal immediately behind the “big three” in Spain. Their Europa League campaigns were also going well with Napoli having won all their group stage matches and Villarreal accumulating 13 out of 18 points. With the winners being among the favourites to win the whole competition a fascinating match lay in wait. For much of the game the home side struggled to build attacks from deep within their own half. There were several underlying factors behind this, some coming from their own failings and others from the strengths of their opponents. One of the major flaws in Villarreal’s game was their base positioning and spatial occupation. Firstly the structures were often far too wing-oriented with both the full-backs and the wingers acting in the wing spaces. This alone weakened their potential to progress their possession centrally with a limited number of players available to offer passing options. Furthermore Villarreal lacked a constant presence in the 10 space with the wingers often acting wide, the forwards against the defensive line and the central midfielders dropping deep. Although this was at times helped with one of the forwards, often Soldado, dropping into these areas it was relatively simple for Napoli to cover. This general positioning and movement dynamics created wholly unsuitable structures for Villarreal’s possession game. Their poor staggering meant several players were acting on the same horizontal and vertical lines. This led to a very basic axis in their passing, with most options being on a vertical or horizontal basis. When vertical and horizontal passes exist merely as part of a wider and highly varied possession game they can possess good value in manipulating opponents. However when vertical and horizontal passes define one’s possession game it is very difficult to force opponents into complex defensive actions. This is exactly what Marcelino’s side suffered from, with little potential to progress centrally they were easily forced into wide areas early in their build-up from where they were often pressed into giving away possession. Villarreal not very compact here…wait, you mean they have the ball?! Whilst these major issues in their possession game handicapped their offensive potential, the strong defensive display by their opponents ensured that whatever potential Villarreal retained came to nothing. Napoli showed a strong collective focus on coverage of passing lanes within their option-oriented zonal scheme. They also demonstrated good unity in their ball-oriented shifts and generally moved with clean mechanisms in pressing, shifting and covering. As mentioned in my team analysis Napoli’s base shape in defence is a 4-1-4-1/4-5-1. From there they move into situational 4-4-2 structures for access in pressing, with the ball-near midfielders stepping up to press alongside the central forward who attempts to block passes between the centre backs. This defensive scheme is a good example of why a team’s movement mechanics are far more important than their basic formation. In theory a 1 striker defensive system may struggle to generate the access required to direct their opponents’ build-up due to the lack of ability to cover both half spaces. However with intelligent movement this potential inferiority can be offset and this is exactly what Napoli did. Gabbiadini would wait until one Villarreal centre back had received the ball before moving in between the receiver and the other centre back. The ball-near central midfielder would then step out to press the ball carrying centre back whilst preventing the pass into Bruno or Trigueros with their cover shadow. The remaining two central midfielders would at times flexibly orient themselves to Villarreal’s central midfield duo only when they could still maintain good distances to one another and the other team-mates. With these movements they removed Villarreal’s ability to play vertically or to switch the ball out of the press. This enabled them to force the home side into wide areas almost instantly in their construction and from these areas the lack of staggering meant the ball carrier was easily isolated and forced into giving away possession. At times this was through a lack of passing options meaning the full backs could only play aimless balls down the flanks. At other times these turnovers were created by Napoli guarding the nearby passing lanes and intercepting passes with simple anticipatory movements. One of Villarreal’s main strengths is their strong defensive positioning which helps them dominate their desired areas of the pitch and direct their opponents into less favourable positions. With their two forwards occupying positions in the centre and covering passes into midfield Villarreal aim to force their opponents to move wider. Several teams therefore struggle to build-up in central areas against Villarreal. Sarri, however, had different ideas. Valdifiori was used as something of a decoy with his positioning attracting the attention of Villarreal’s two forwards. The 8s however were the most crucial to their build-up in this game as Sarri devised a build-up scheme that consistently allowed them to build and progress through the centre of the pitch. When the centre backs had the ball the ball-near 8 would drop onto the same line as Valdifiori to the side of the Villarreal forwards and receive the ball. With the forwards busy covering Valdifiori and the 8s position being too narrow for Villarreal’s wingers, Bruno or Trigueros were forced to come out to prevent the receiver from turning out. The dropping 8s only intended to offer themselves as a wall pass to bypass Villarreal’s front two and when they received the ball they would quickly play it into the holding midfielder to escape the incoming pressure. When Valdifiori received the ball accessing the 10 space was relatively simple due to one of Villarreal’s midfielders being enticed forwards to press and he would often do so locating the likes of Insigne and Callejon with a first time pass. 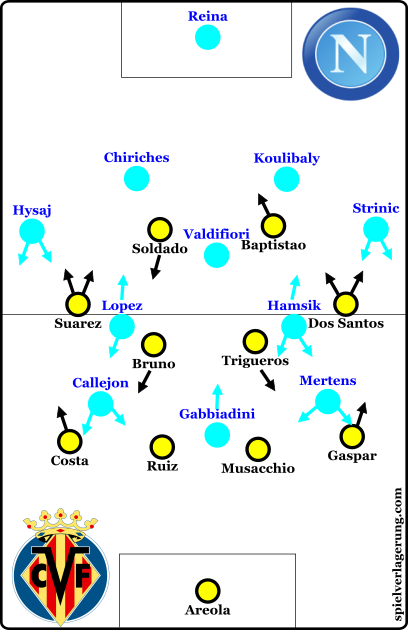 This impressive adaptation allowed Napoli to access the 10 space from a position where so many struggled to advance past Villarreal’s first line. The role of Napoli’s 8s in their possession game is generally asymmetric, with the ball-near one usually being slightly deeper than the ball-far one who moves forward to add to their presence between the lines. The movement here however was particularly exaggerated however with the intention of building through the half spaces in reaction to Villarreal’s central covering. Although they managed to penetrate Villarreal’s midfield lines fairly regularly Napoli were not always able to convert this into chances and there were a number of reasons behind this. Firstly they failed to show their usual level of cohesion in their final 3rd actions. The timing of passes and runs were sub-optimal and led to the breaking down of several moves. At times passes went behind their team-mates killing the momentum they generated, at others the runs were made too early ending up with the runner offside. With Insigne, Higuain, Jorginho, Allan and Ghoulam all missing from the line-up this was somewhat understandable. As synergy and team-tactical cohesion are partly the result of consistent time on the playing field it was no great surprise to see the likes of Gabbiadini and Valdifiori lack understanding with more regular starters such as Callejon. Furthermore Villarreal’s zonal scheme and defensive compactness had benefits even after it had been partially breached. By maintaining appropriate distances Villarreal maintained the capacity to apply pressure to the ball carrier. This meant they could limit the danger Napoli produced from these situations. After the interval Marcelino reacted to stifle the scheme that Napoli used so effectively in the first half. Whilst the forwards would still position themselves to block passes into Valdifiori once the Lopez or Hamsik received the ball they would move deeper to prevent the wall pass back into the centre. This had the effect of forcing them to pass out wide especially as the nearest Villarreal midfielder would still push up to prevent them from turning. This helped Villarreal lower the frequency of Napoli’s penetrations. Not to be undone, Sarri had another trick up his sleeve. As the initial scheme was no longer viable he adapted the roles of the 8s. The ball-near 8 would now move higher and wider whilst the ball-far one would drop to provide the first progression option. Naturally this led to increased diagonality in Napoli’s build-up. This scheme was slightly more difficult for Villarreal to stop. The diagonal nature of these passes allowed the recipient to receive on the half turn and move forwards quicker. Naturally Villarreal’s ball-far midfielders were more cautious in stepping out due to the fear of creating a heavily imbalanced structure. The alternative was to use one of the two forwards deeper to block the zones that these passes were going through. However this would mean weakening their control of the 6 space and their access to Napoli’s centre backs. This lack of access could create issues later on as they would have time to drive into midfield and create an overload. Towards the end Napoli increasingly sought an away goal and equaliser after Suarez’s free kick gave the home team the lead. The orientation of the wide players was shifted in line with their increased focus on crossing. The full-backs were now more consistently positioned in the half spaces with the wingers moving right out to the flank, particularly Mertens on the right. To keep their zonal occupation consistent the dual 8s balanced the structure by moving higher to give Napoli presence behind Villarreal’s midfield line. With Napoli increasingly desperate for an away goal their structures became more and more unclean which reduced their ability to defend the home side’s counter attacks. Villarreal usually move forwards in their offensive transitions with a combination focus involving several players and leading to a variable transition. Therefore from a strategic perspective the passing lane focus in Napoli’s counterpressing was not an advantageous match-up for Marcelino’s side. An example of Napoli guarding the passing lanes in their counterpressing. The passing-lane focus meant Villarreal’s players found several routes of passing combinations blocked off and they found themselves needing extra touches and longer dribbles to launch counter attacks. The issue they found however was that their actions in these transition moments had been trained constantly and had become automatized. Several counter attacking opportunities, therefore, were ended with interceptions. However as Napoli threw more and more players into the box their ability to prepare their counterpress reduced and Villarreal became increasingly dangerous on the counter attack. This was also related to their adapted positional structure, with the 8s operating higher up when the full-backs lost their discipline and moved into wide areas Napoli lost the required presence in midfield to deal with counter attacks. Villarreal ran out victorious despite a largely inferior performance both to their opponents and to their usual standards. It was a game full of adjustments and improvisations as both Marcelino and Sarri attempted to give their side the upper hand. Whilst Sarri’s team had the edge tactically, they were unable to turn their dominance into a positive result. As we would see later on Villarreal would go on to win the tie with a fortunate draw at the San Paolo before strong performances and wins against Bayer Leverkusen and Sparta Prague. Their league campaign also ended successfully with a 4th placed finish securing a Champions league qualification spot. Napoli were in a mid-season slump both domestically and in Europe which harmed their chances of ending the season with silverware. Whilst they recovered some of their earlier season form they lacked the consistency of their Scudetto rivals Juventus and ended the season in a respectable 2nd place. I agree with André. It’s a great idea. It basically made my day! I like your style anyway, JD. Great analysis! And what a great idea to retroanalyze some games from this season, there were some amazing ones that went completely under the radar. I’d suggest you to watch Leverkusen vs Sporting CP(2nd leg), also from the Round of 32 of the Europa League, the compactness of both teams(with and without the ball) was almost obscene. Cheers for the suggestion (and compliment!) I’ll have a look.